Firefighters walk away from a home on Crosby Crescent after keeping a fire that started on a chair from spreading to the rest of the house. 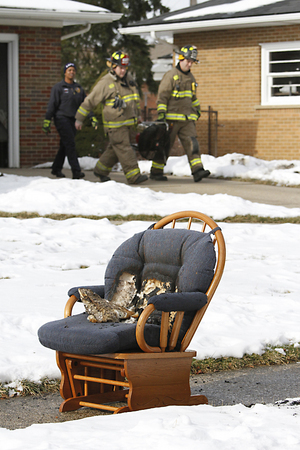 Ann Arbor firefighters hosed down a burning chair this afternoon before it spread to a home at 1214 Crosby Crescent. Homeowner David Miller called 911 to report his basement was full of smoke just before noon. Miller had been out of the house for about an hour late in the morning when he returned home to the smell of smoke and the smoke detector activating. Firefighters arrived and found a chair smoldering in the basement. They removed it from the house and hosed it down on the sidewalk. Though no damage was done to the house, Lt. Scott Robertson said the Millers were lucky the fire hadn't spread beyond the chair. He said the pressure of the smoke and heat would have eventually caused the chair to burst into flames and could have spread further. Robertson said the cause of the fire is not known. Miller said he plans to inspect his basement fireplace and electric system to prevent future fires from occurring.